From our engineering project we can mimic a closely resembling sine curve that is based on the Singapore sea tides timings. The final specifications are that the volume of water to be transferred is 10.9l and the final flow rate is 31.14ml/s. These specifications enable the tide simulator to work well. 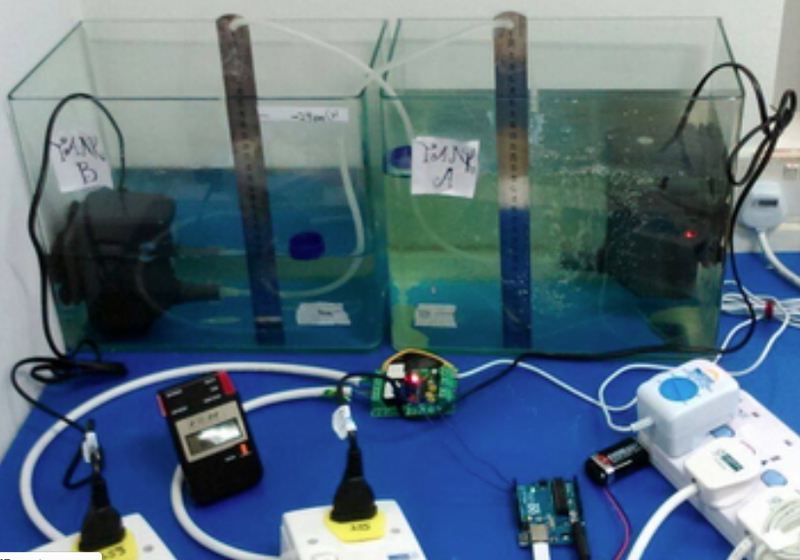 We were able to use a minimal of an arduino, two tanks, a relay board and two pumps. Sea creatures now would be able to be more accustomed to its artificial habitats due to the new surroundings being almost identical to its own natural habitat in the tide simulator. Restaurant owners can use the tide simulator to rear intertidal zone sea creatures, such as crabs, and since they can better accommodate to a tidal system similar to its own habitat, the crabs would be fresher. Hence, the restaurants can sell these crabs to customers at a higher price because the quality is better. Also, marine life parks can make use of the tide simulator to better take care of their sea creatures that are affected by tides. The animals would not feel like their new artificial habitat is very foreign or different from their natural home. Biologists can observe these creatures right in their labs using the tide simulator, without having to travel far because the animals are in the sufficiency of their own environment. They can conduct various experiments such as comparing an organism put in still water versus an organism which is put in the tide simulator. Hence, we would be able to gain more knowledge of the creatures, so we can use the information to ameliorate lives. The tide simulator can be used as an artificial habitat for sea creatures, so that they would be more accustomed to its new habitat because its new habitat is largely similar to its old, natural habitat. Thus, the creatures would behave as they usually do in their natural homes, the ocean, with little difference so research conducted on them would be more relevant, pertaining to the fact that their behaviour would not be irregular. We can further research on intertidal zone sea creatures that can be put into the tide simulator, such as crabs. We can investigate the other features of their natural habitat to further improve the duplication of the intertidal zone. In future, we might even progress to building a whole eco system just for these creatures and we can also study the behaviours and mannerisms of marine sea creatures of marine sea creatures and the different factors that affect the operation of tides. All this can be done as the tide simulator imitates tides in the lab so it is not necessary to visit the sea to conduct experiments or research.